The Tah Mah Lah residence has been awarded the title of the "greenest house in America." Owners Paul Holland and Linda Yates wanted to create a multi-generational house that embodied the idea of regenerative design. The residence reaches beyond LEED Platinum rating to achieve Net Zero Energy, Net Zero Water, as well as, meeting the Living Building Challenge requirements. It's also quite a show stopper! When the house was built a resin-bound, decomposed granite material was used for the driveway and carport. The material did not end up meeting the owner's multi-generational goal, and was failing after only three years of service. While looking for a replacement material Linda Yates came across another BAPC driveway in her neighborhood, and learned how environmentally-friendly pervious concrete is. Due to the lengths they went to design and build their house to such a high environmental standard, Paul and Linda were really concerned with the longevity of the material, and the embodied energy and carbon the pervious concrete would contribute. To reduce the environmental impact of the driveway and carport at Tah Mah Lah we utilized several materials that helped to reduce the embodied energy. The aggregate used in the concrete was locally-sourced from a quarry less than 60 miles away. Macrofibers were used for reinforcement to extend it's service life beyond the typical 30-50 year service life; a portion of which were made from 100% recycled-content. Reuse of the driveway’s original base layer reduced on-site excavation, new material extraction, and waste. To further remove any concerns about carbon footprint BAPC conducted an embodied energy and carbon analysis for the installation of the driveway using pervious concrete. Embodied energy and embodied carbon for the new pervious concrete driveway at Tah Mah La as compared to using conventional concrete and asphalt. Using Pervious concrete produced a 71% reduction in embodied energy, as compared to asphalt; and a 64% reduction in embodied carbon, as compared to conventional concrete. Figures were calculated and estimated using the Inventory of Carbon & Energy (ICE) Database. Please note, this analysis is an as-installed snapshot, not a life cycle assessment. As such it does not account for the significantly shorter lifespan of asphalt, and the embodied energy and carbon of numerous asphalt replacements within the typical 50 year lifespan of pervious and conventional concrete. Portland cement, a key ingredient in concrete, represents 5% of all global carbon emissions produced every year. Pervious concrete with its 20% air void structure and mix design - in which industrial by-products are utilized - lends itself to those seeking a lower carbon alternative. Reducing the amount of portland cement consumed produces significant reductions in embodied carbon. Upcycling the industrial by-products fly ash and slag into the pervious concrete led to the largest savings in embodied carbon, reducing it by 50%, and kept those materials out of a landfill. For Tah Mah Lah we reduced the driveway’s total embodied carbon by an estimated 64%, as compared to conventional concrete, through the omission of steel, reduction of portland cement consumption, and the use of industry by-products. When compared to asphalt we reduced the driveway’s total embodied energy by 71%. An additional environmental benefit of replacing the impervious decomposed granite with pervious concrete is that the driveway and carport are now also acting as a natural stormwater treatment site. Studies have found that pervious concrete pavement systems naturally remove 94-100% of all pollutants from stormwater. The treated water then continues to infiltrate into the lower soil layers where it can replenish local groundwater sources and waterways. Just as important as its low-impact on the environment, the new driveway complements the house and the surrounding environment beautifully. 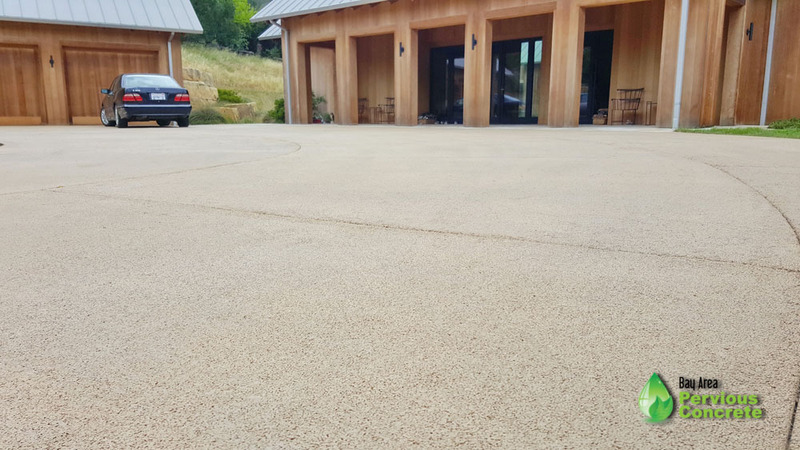 The Portola Pervious Concrete™ used for this driveway and carport is certainly not low-impact on the eyes! Pervious concrete was just one of the many wonderful things that makes the Tah Mah Lah residence the "greenest house in America", visit the project's website for more information. To learn more about this new pervious concrete finish option, read the full blog post about Portola Pervious Concrete™.